Having fun felting, KSFF reflections and preparing for the workshops in Lexington! I've been having great fun with Jan this week, scouring the local Goodwill stores for printed silk (she's still in training but a quick learner Dawn! 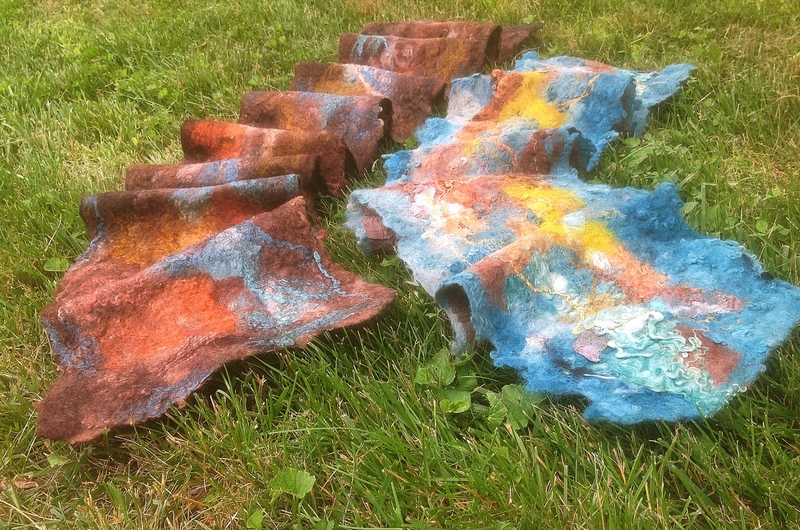 ), exchanging skills, brainstorming ideas, felting and preparing for two days of workshops in Lexington this coming weekend! My first task was to finish felting the nuno scarf I laid out last Saturday at the Kentucky Sheep and Fiber Festival, it's really interesting to see the contrast between the scarf that Jan felted and the one I've just finished. We both chose a western inspired colour scheme of chocolate ponge silk with brown and teal shades of alpaca plus loads of Roo and Elizabeth's beautiful hand dyed bamboo for surface embellishment. Jan also added some of her own dyed cotton gauze on top of the alpaca and I used quite a lot of Firestar for added glamour and shimmer, I love them both! At this point I have to say that I LOVED every minute of the KSFF!!! Teaching for the full day on Saturday but only half a day on Sunday was a perfect combination. I was able to have a good chat with Roo and Elizabeth on Friday evening plus check out my workshop space, having Sunday afternoon free gave me plenty of time to do the rounds of all the stands, see the animals plus pick up a tonne of yummy fibre to bring home to Ireland, not ALL for me mind you, some for Anita who's looking after my studio while I'm gone. The organisation of everything was SPOT ON, thanks so much to all the committee and helpers who were friendly, helpful and put on a wonderful event! 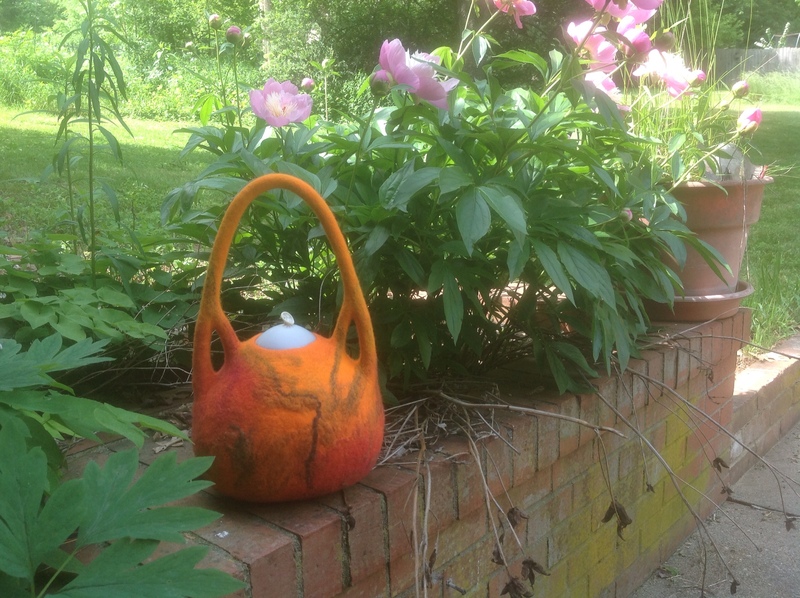 Yesterday I shared the open resist method of making vessels with Jan, in turn, I was inspired by a wonderful teapot she felted at a Pam MacGregor workshop to try including a handle in one of my own vessels. I love this exchange of ideas and brain storming, I've now an idea in my head for some new bags with long shoulder straps (purses! ), I doubt that I'll get to felt them though until some time after I return from teaching in Portugal! This week long residential workshop is now fully booked but if you live within shouting distance of Lexington why not come and join us for our workshop here next Saturday 25th May!!! If you're interested in more information or reserving a place please email me ASAP, if you don't have any idea what to make don't panic (because I'll help you) and if you need materials in a hurry Jan will bring extra on the day if you let her know which colours you prefer. I'll leave you today with this picture of my new vessel drying, I call it 'Ode to Pam'. This entry was posted in America 2013, Felt, felt workshops, nuno felt, workshops and tagged Felt, felt vessel, felt vessels, felting workshop, nuno felt, nuno felt scarf, nuno felt scarves by Nicola. Bookmark the permalink. Awesome, particularly the technique of making tea pot. Looks sturdy, firm and full. Really love it so much. Hope I can get the idea of making. LOVE the new vessel! Absolutely gorgeous!